Brave the rugged Alaskan landscape for a chance to fish the crystal blue waters and reel in some massively huge catches. Click here to play! As this untamed landscape can be difficult to navigate, you’ll need to find a guide. Spin in as many guide symbols as possible as this experienced outdoorsman will bring in a top payout worth up to 400 times your line bet. He is also a bonus symbol that will trigger a special fishing bonus game if you can spin him on selected reels. Then, find a stream and start casting your line. Try to bring in a fish or two, as these symbols will payout well. In fact, the salmon will bring in up to 300 times your line bet while the Sockeye will grab up to 200 times your line bet. There are plenty of other symbols available on this trip, including trophies, bears, eagles, planes, boats, reels, and lures. The lure box is a special scatter symbol that will not only multiply your total bet if you can spin three or more anywhere on the board, but it will also award up to 15 free spins. 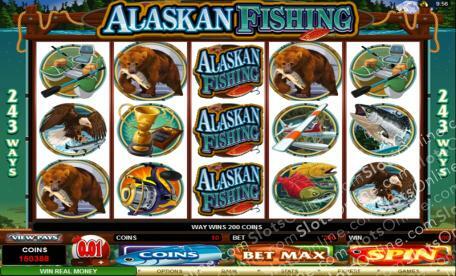 Journey to the isolated streams of Alaska for a chance to bring in some huge trophy wins! The packed lure box is a scatter symbol. Spin three or more anywhere on the board to multiply your total bet. Three or more will also trigger a number of free spins in which all payouts are doubled. The Angler Guide is a substitute. He will replace all others, excluding scatters, to help you bring in more wins. He will also payout up to 400 times your line bet and will trigger a bonus game when spun across selected reels. Spin the Angler Guide on reels 1 and 5 and you will trigger a second screen bonus game. During this game you will cast your line into the stream five times to bring up bonus prizes.